Of all of the world’s musical repertoire, the one work that feels most intimate to me is — very oddly, I admit — Mahler’s Das Lied von der Erde. In part it is on account of the circumstances of my discovery of it, which took place in exile, in America: I felt deeply unhappy there and the work’s minor key suited the mood. More: in the alien setting of the New World, Mahler’s music seemed to me a breath of the old, familiar ways of Mittel Europa: an unapologetic assertion of high brow culture (elitist, arbitrary) and of the fundamental tragedy of life (depressing). To assert both simultaneously in the setting of an American liberal art’s college with a victorious football team seemed the very perfection of defiance. 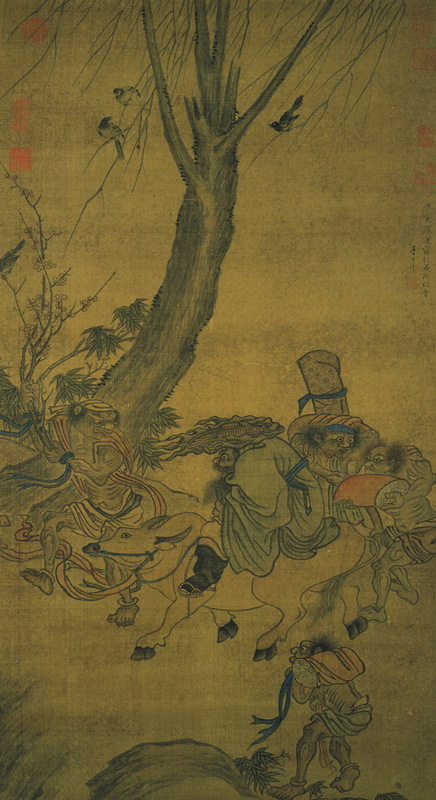 The tragic — perhaps even hysterical — mood of the song cycle also had a therapeutic effect: in it, Chinese poets spoke about their sadness, despair and longing in ways which were both familiar and safe: familiar because I could recognize their feelings; safe because, after all, they were Chinese, on the other side of the planet, ten centuries ago: like a white man listening to Alabama Blues, I was cheered to know that others had had it much worse. Perhaps, Das Lied von der Erde also played a role in the shaping of my future: a fin-de-siecle Viennese work became my introduction to the literature of Tang Dynasty China. Surely, Mahler’s song cycle has played some role in eventually turning one half of me into a sinologist. Das Lied has remained with me since. I listen to it irregularly, in spurts: in good times never, but in bad times — a great deal. It has been with me through most crises of my adult life and through this association it has become encrusted with memories and meanings, acquiring a depth which it perhaps lacks for other ears. Small wonder then that this website delights me. It sets out to trace just how the original Chinese (Tang) poetry became, through a succession of French and German translations — or rather, shall we say, manipulations — the libretto which we know today. Chew’s paper (linked to from the site, read it here) adds an interesting discussion of this process of translation/transformation. 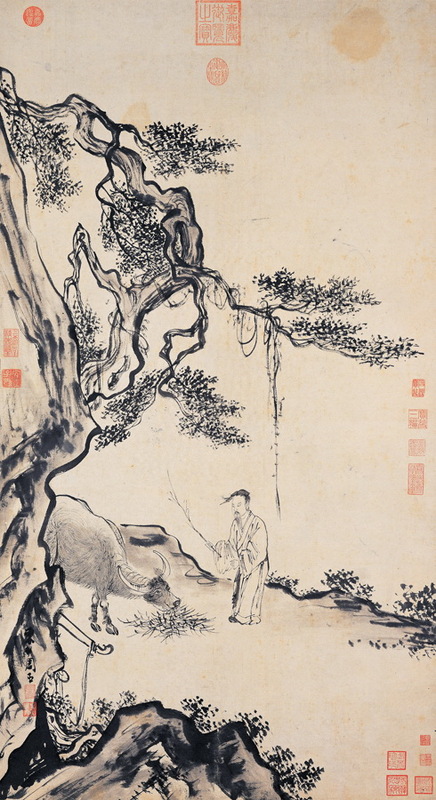 Though his characterization of Chinese as syntactically loose is typical of the Edenic innocence of native speakers — (not having had to learn the rules of their own language, they imagine such rules do not exist) — everything he says about classical Chinese poetry as deliberately setting out to blow up syntax — in order to introduce greater ambiguity — is correct. The 20th century turn in western poetry towards the inscrutable — including silly things like refusal to punctuate or capitalize (as Chinese does not) — is an attempt to move in the same direction: to multiply possible interpretations of the text by intentionally confusing meanings. Empson and Reckert* seem to argue as much. No one has as yet suggested, though, surely, someone should have, that the movement is an imitation of the Tang. 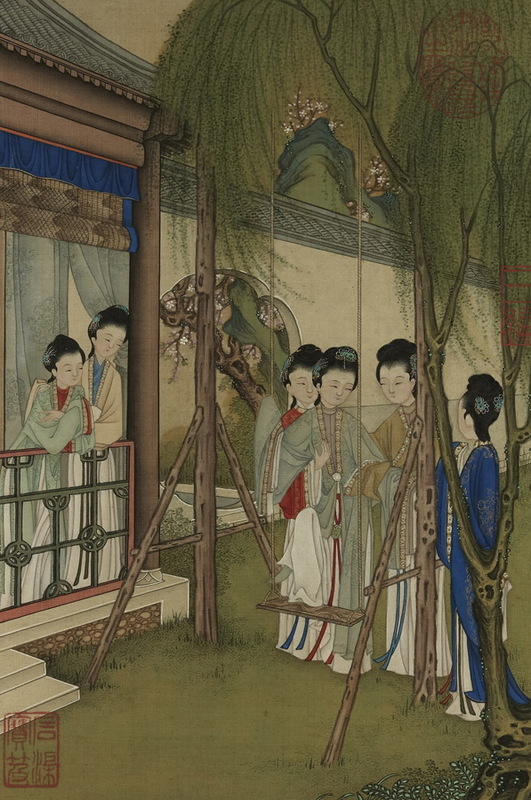 On the other hand, the fact that the European translators of Tang poetry have chosen to infuse it with a burning hysteria which it does not have — the prevalent mood of the Chinese is one of meditative sadness; or to add — Hollywood-like — love interests where there weren’t any (in the Chinese original of Von der Schoenheit, for instance, there is no girl-boy thing, only the very aesthetic pretense of girls’ sadness at their flowers having been trampled by galloping horses) isn’t necessarily an East-West thing, as Chew suggests (i.e. of being untrained in the Buddhist world-view): it’s just the matter of insufficiently sensitive esoteric antennae of the individuals involved. Or, perhaps, should we say, of their emotional immaturity? Adult Europeans can and do — from time to time — reflect on the fleeting emptiness of life. We, too, can be saddened by trampled flowers. Recently, a series of unfortunate events has made me revisit Das Lied. This time I chose to do it differently — and train the full power of file-sharing on the question of interpretation: I compared different performances — most of which have been unattainable prior to internet. Some seventy hours of of house-shaking playback later, my chief finding is that Das Lied is easy to blow — and even the great ones, by and large, blow it, Fischer-Dieskau, included. (Unbelievable!) I suppose that the intense hysteria of the work creates a powerful temptation to slip into mannerism, to “pull out all stops” (“to charge”, as Polish actors say, meaning, of course, cavalry charge): which misses the mark and turns the whole thing into a caricature. Emotional intensity is hard to do well: good actors know that in acting, the hardest scenes to do are those that involve shouting: one has to learn how to shout, as it were, quietly. As a result, my very first recording of Das Lied, (Klemperer, Wunderlich, Ludwig) remains the unapproachable paragon (even if one wishes Ludwig’s voice-coach had insisted on good diction more). Perhaps this recording constitutes an argument in favor of Apostolic Succession? (Klemperer was Mahler’s student; he conducted Das Lied‘s world premiere, which was, from Mahler’s point of view, posthumous, making Old Otto a kind of Saint Peter). Ist mehr wert, als alle Reiche dieser Erde! Dunkel is das Leben, ist der Tod! Wird lange fest stehen und aufblühn im Lenz. Du aber, Mensch, wie lang lebst denn du? Nicht hundert Jahre darfst du dich ergötzen! (See full text and translation here). While listening, I caught myself doing the math, surreptitiously: I am indeed not likely to ergötzen myself a hundred years; but even 75 — let us say — leaves a vast stretch of time yet ahead of me: indeed, as long again as I have lived since reaching adulthood. Plenty of time, then, right? Further, during the first half of my adulthood (if I am to look at it that way) I have achieved a good deal; perhaps it’s OK to hope that as much yet may await me in the future? And, while the main achievement of the first half of my adult life was to establish myself economically — earlier and better than most, perhaps — but at the inevitable expense of a lot of deferred satisfaction; the point of this deferral was, of course, that once I arrived at a certain level of comfort, I could stop deferring and — as they say in Detroit — put the pedal to the metal. And, in a way, this has worked: here I am on the cusp of the second half of my adult life, ready to party, and with the means to do so. The future towards which I have been saving, then, is here. Yet, how miserable the future turns out now that it has arrived! I can barely walk, so the longed-for and long-deferred mountain expeditions will not in all likelihood be possible; desired women tell me that despite my age I am still attractive and that therefore other women (get it?) will surely fall for me; a bronchial condition means I have had to quit the evil weed; and a fatty liver — wine only sporadically and in moderation. (Hence the significance of the Trinklied excerpt above: sporadically does indeed place a serious limitation on one’s ability to enjoy a full beaker of wine at the right time!). I now realize with consternation that of all the pleasures of my insufficiently sinful youth, I am left with the one I have always liked least — playing the markets! Is this why I deferred satisfaction for all these years — only to discover that, when I am ready to have it, it is too late? That I have missed the chance? I have once written an essay on the third age of woman — the, let us say, 40-55: the no-longer-nursing-mother but not yet crone. In the essay, I deplored the absence of cultural role-models for that un-recognized (and longish) age in which women find themselves trapped directionless: an age in which the old models — the pleasures and methods of their youth — no longer work; and yet an age at which they are not yet dead, not yet ready — not yet resigned — to be no more than kindly and ineffectual grandmothers. An age like mine today: in which the decline in appetites has not yet matched the decline in abilities. I wrote that essay with deep sense of pity, from the perspective of a somewhat younger age, when I still walked, and drank, and smoked, and when desired women were not necessarily different from the available ones . I had no idea then how quickly — barely half a decade! — my own third age would come. I guessed it would, but I figured I had time to figure out how to deal with it by the time it did. But here it is and — like all those women whose fate I once becried — I find myself unready. Now, surely you must agree, Dunkel ist das Leben! *(Serendipitously, Reckert’s languages are almost all mine).